Like humans, dogs can quickly come down with a bad case of heat stroke. However, unlike people, our canine counterparts have very limited ability to cool off by sweating. Dogs have sweat glands on their foot pads only. Their main mechanism for cooling down is panting and it can be insufficient to lower body temperature on a very hot day. 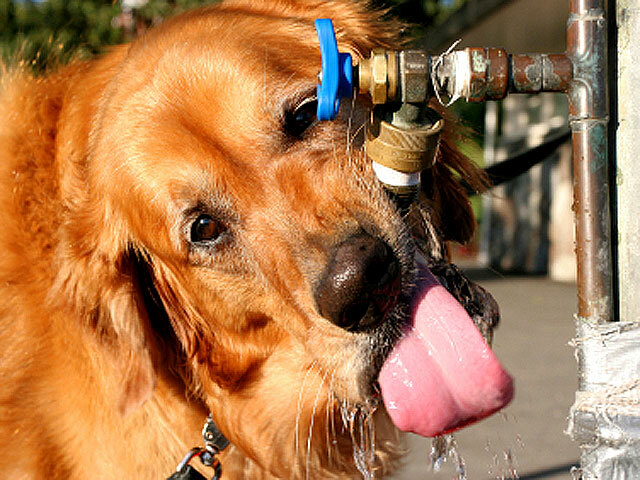 Whether your dog is playing in the back yard or you're exercising with your dog in the park, make sure you always have an ample supply of water on hand. At home, make sure his or her water bowl is in the shade so the water stays as cool as possible and so your pet doesn't run the risk of burning its tongue on an over-heated bowl. An easy way to do this is to use half ice and half cold water. If you're out and about with your pet carry an extra bottle of water with you and bring along a small container from which they can drink. In the hot summer months, consider walking your dog either in the early morning or late afternoon when the sun is least harsh. Additionally, be sure to walk your dog on grass or dirt to avoid burning their paws on the hot pavement and provide access to shade at all times. As summer nears, it's important to provide your pet with proper treatment for the prevention of heartworms, ticks and fleas. Depending upon the climate in which you live there are varying guidelines, check with your pet's vet to ensure you're doing everything possible to protect your pet. Make sure your vet knows all of the products you are using as well as all the medication your pet is on to prevent any drug interactions. If your pet spends a lot of time outdoors, also look into purchasing a pet-safe bug repellent to prevent annoying insect bites. While it might seem like a good idea to bring your pooch along to the local festival or parade, your dog is almost always better off at home. The heat, noise, crowds and general excitement can be physically and emotionally taxing for your pet causing a great deal of anxiety and stress. In the heat of the summer, many pet owners believe it's best to shave their dogs - and in some cases it is. In others, it's not such a good idea. If your dog is a swimmer, gets easily matted, tends to shed a lot or spends a lot of time outdoors, you might want to consider a summer shave. Reasons not to shave your dog include that their fur provides protection from the sun, biting flies, and mosquitoes. Believe it or not, many dogs feel "naked" and vulnerable without their coats. Always check with your vet before shaving your dog in the summer. As in people, overexposure to UV rays can give your dog a nasty case of sunburn, peeling skin, painful inflammation and also increase the risk of skin cancer. Because dogs have fur, people often assume they are not in danger of getting sunburned. This isn't true. While fur does provide some level of sun protection, the bridge of the nose, ear tips, skins around the lips and other areas lacking pigmentation are highly susceptible to sun damage. There are specially formulated sunscreens available for dogs but check with your vet to find the best solution for your pet. Swimming with your dog is great exercise and can also provide relief from summer heat. Despite popular belief, not all dogs were born to swim. Theoretically all dogs can swim, however, some breeds such as Bulldogs, Basset hounds and Pugs have more difficulty than others. When encouraging your dog to swim it's important to know its physical ability, stamina, body shape, condition and breathing ability. Fit your dog with a PFD (personal flotation device) if you are not sure about his swimming ability or if you plan on taking him boating. Life jackets made for dogs keep their head above water and have a handle on the back to make it easier to grab them out of the water. The most important thing is to remember to never force the dog, take is slow, have reasonable expectations and have fun. There are many safety precautions you should take when your dog is around water. First and foremost, make sure your dog can swim. Other dangers are less about the dog and more about the place they are swimming. The key to water safety is to be aware of your surroundings, make sure your pet is wearing a floatation device, never let your pet drink the water in which it is swimming, and always hose off your pet after swimming. If boating with your pet remember the following: dogs get seasick too so be prepared, make sure your pet has proper identification or is micro chipped in case it falls overboard and is picked up by another boater or swims to land, and remember, dogs don't know how to use the head so have a potty plan in mind. You should NEVER leave your dog in the car no matter how brief a time. A car can heat up quickly even when it's relatively mild outside, even with the windows cracked. On a summer day temperatures inside a vehicle can climb in minutes and can spike more than 40 degrees in just an hour. While you think you're making your dog happy by bringing it along for the ride, you could very well be jeopardizing its safety. And you know the old adage: Better safe than sorry. Click here for tips to keep humans safe in the summer heat.